I’ve had a wonderful motivational speaking career that has spanned for over 30 years. There are hundreds of public speaking tips I’ve learned along the way. I’m going to share as many of them with you as I can. They start off speaking in their organization or in their company or sometimes will be asked to talk on their subject to a small group of people within their industry. They put together some notes and share what they know. When people respond positively, the speaker will suddenly realize that they really enjoyed it too. And that is one of the main reasons people want to get into speaking. Whether you’re speaking in a small meeting or to a larger audience, I’ve covered some of the techniques in this post. Learning the art of public speaking has helped many people make career jumps in business, build confidence, get promoted, and even travel the world. My friend Bill Gove who used to be one of the top speakers in America would be approached by people all the time telling him they wanted to be speakers. Often they would tell him they wanted to be famous, or make a lot of money and be a star on the stage. He pointed out that these were not good enough reasons. Just to want to make money and have fame were not good enough reasons. The reason why successful people are successful in speaking is because they have a burning message that they want to share, that people can really benefit from. Zig Ziglar, who is one of the great and legendary motivational speakers, used to say that he gave 3,000 talks before he was paid for the first one. I worked with Zig for years, traveling and speaking together. I finally found out that what he meant was that he started off in sales and then trained salespeople for a decade or more. Every morning he would give a little sales talk to his people. He would tell little stories and give little motivational and sales tidbits, and that was his beginning. Remember that 95 percent of speaking is finding an audience. So you have to find an organization that already has an audience. Somebody is already putting meetings together. Getting people together in a room is the hardest thing you’ll ever do in your whole life. Most speakers have no capacity whatsoever to get people into a room. They have to find someone else who can get the people into the room, somewhere, somehow and any size of group. Keep reading and I’ll tell you exactly where you can find those people . . . So you have a specialty and you decide you want to speak . . .
At the beginning, you specialize and always focus on a single subject. When you talk about your speech, always talk in terms of the transformation, change, or outcome that will occur when people listen to your talk. You never talk about the material in your talk, you talk about the outcome. When you do this, you will be able to book many more speeches than if you solely talk about your material. Every single speech is an opportunity to solve a problem that the listeners have. As always, clarity is the critical word here. You’ve got to be clear about what problem your speech is going to solve, and what answers it’s going to give. Even a motivational speech is intended to help people, motivate them, help them focus, and to channel their energies. I remember one of the first experiences I had was being invited to speak to a large group after someone had heard me speak. At the end of the talk, which was about 60 minutes, the organizer came up and gave me an envelope. He said “Thank you very much. I really appreciate you being here.” I walked away and opened the envelope and there was a $500 check. I had been willing to do the talk for free on the off chance that people in the audience would come to my seminar. I still remember how impressed I was with $500. So what will happen if things go well is that people will approach you and offer to pay you? The rule in professional speaking they say is, if you want to start from scratch, go out and give three hundred talks. Resolve to give free speeches, and do them as hard and as fast as you can. There are between two and three million meetings a year in the U.S. alone . . . These are Rotary meetings, Lion’s Club meetings, non-profit association meetings, automobile club meetings, and every other kind of business organization meeting. And every single one of these groups is looking for a speaker for their next meeting. What are you good at? What do you love? You can speak about anything you want as long as you are passionate about it and you specialize in it. I began speaking in business, sales, and leadership qualities because that was my specialty. The fear of public speaking is very real for a lot of people. In fact, more people fear public speaking or glossophobia over dying. Thankfully, there are many ways that you can learn to overcome your fear of public speaking (here are 27 of them). None of my tips include having to picture the audience in their underwear. Some public speaking tips to overcome your fears include old-fashioned practice, watching yourself speak in the mirror, and lightly exercising before you go on stage. Speaking professionally really is not something that you can decide in favor of or against. You don’t really have a choice. If you want to realize your full potential in the world of business, you must learn how to improve your effective communication skills to better communicate with people. 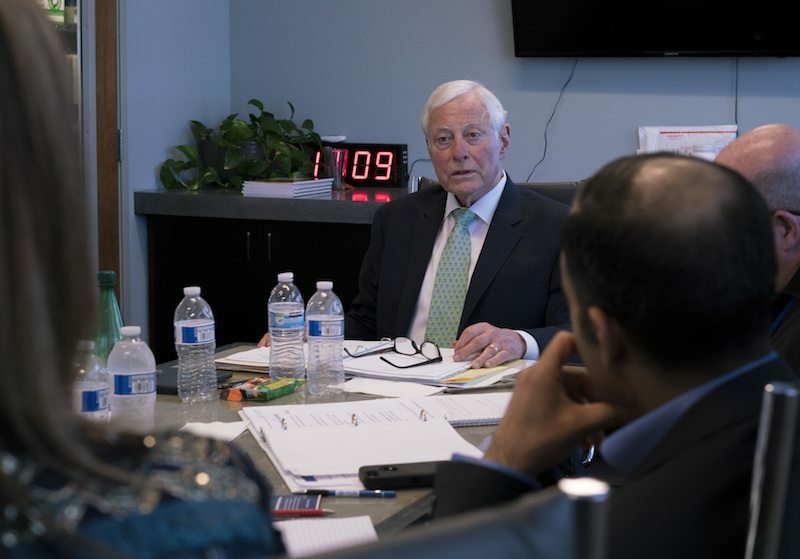 I have seen executives make extraordinary career jumps, saving themselves as much as five to 10 years of time working up the executive ladder, simply by using effective communication skills at a corporate meeting. I’ve observed men and women who’ve put their careers onto the fast track by overcoming their fears and developing their presentation skills. Pay any price, spend any amount of time, overcome any obstacle, but make a decision, right now, that you’re going to learn to speak well before groups and practice your presentation skills consistently. It could be one of the most important decisions you ever make in assuring long-term success in your career. But while it’s true that the only way to become good at anything is by repetition, over and over, until it becomes second nature, there are many things that you can do to be more effective speaking in front of audiences. The starting point in the art of public speaking is to pick a subject that you really care about. It is to think through the subjects that have had an extraordinary impact on you, the subjects that you would like to share with others because you intensely feel that others could benefit from your knowledge. With this, you have a springboard off which you can leap into your first public talk. The second part of public speaking is preparation for effective communication. Preparing is more important than anything except caring about your subject. It’s not unusual for a person to spend many hours, days and even weeks preparing for a talk. If the first two parts of successful public speaking are caring and preparing, the third part is practicing and improving your presentation skills. If you have a tape recorder or, even better, a video camera, record yourself giving the talk from beginning to end. Then listen to it or watch it, and make notes on how you could make it better. If you’re using a video camera, look into the camera and use the same facial expressions and the same body gestures that you would use if you were speaking directly to someone. When you critique yourself, be very hard on yourself. Remember, the more honest and objective you can be about how you come across to others, the faster you will build effective communication skills for success. Practice makes perfect, and perfect practice makes it even more perfect. If you practice consistently, you will find that your presentation skills have dramatically improved over time. Remember, your ability to speak effectively in front of people can do more to advance your career and your life than perhaps any other skill you can develop. The most powerful words that you can use to prepare yourself mentally for a speech, or for any event, are the words I like myself ! Before you get up to speak, say to yourself over and over, ‘‘I like myself! I like myself! I like myself!’’ These words have a wonderful effect in raising your self-esteem and lowering your fears. The more you like yourself, the more confident you will become. All improvement in your outer performance begins with an improvement in your mental pictures. You should ‘‘see’’ yourself standing calm, confident, relaxed, and smiling as you address your audience. See the audience leaning toward you, smiling, laughing, enjoying, and hanging on every word you say as if you were amazingly intelligent and entertaining. You can actually ‘‘get the feeling’’ that you would like to have if you were already a successful and popular speaker. Here is an important discovery: Your subconscious mind cannot tell the difference between a real event and an event that you vividly imagine. 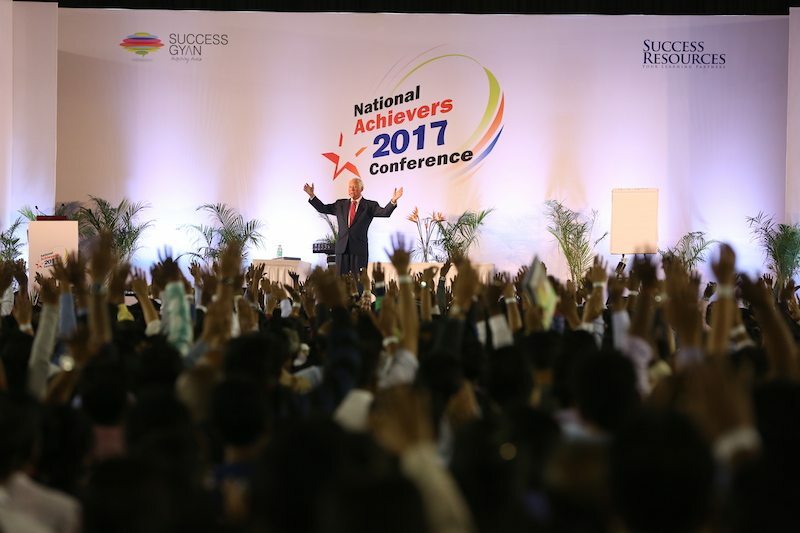 If you visualize and replay a positive speaking experience 10 or 20 or 50 times in your mind, your subconscious mind records that you have just given 10 or 20 or 50 successful talks, all ending in standing ovations and happy audiences. Your ability to speak well and persuasively in small meetings can have an extraordinary impact on your life and career. In business, others continually assess and evaluate you. Consciously and subconsciously, they are upgrading or downgrading their opinions of your personality, ability, competence, and level of confidence. For this reason, you must think of business meetings as important events in your career. The mark of the professional in every field is preparation. The more thoroughly you prepare for a meeting of any kind, even with just one other person, the more effective you will appear and the better results you will get. The power is always on the side of the person who has prepared the most thoroughly. The individual who comes into a meeting unprepared has diminished power and sometimes no power at all. Your job is to speak to win on every occasion. Your goal is to be seen as an important player in every conversation. Your aim is to persuade others to your point of view and to make an impact on your world. You do this by thoroughly preparing for every meeting that you hold or that you participate in, and you do it making others in the room feel important. The more you can involve the participants in the discussion as you go along, the better sense you will have for how they are thinking and feeling, and the more likely it is that they will agree with you at the end of your presentation. The truth is, in order for your presentation or speech to have its greatest effect you need to be able to entertain and wow your audience. Here are some tips that I use in my speeches to give effective presentations. That’s how I start a speech. I’ll even say that I’m going to share some ideas with them, that are practiced by the top 10%of people in this field. I’ll tell them that these ideas can help them to move ahead faster than they ever imagined possible. Then I launch into my talk. The key to keeping an audience engaged during a speech is with personal stories. Stories are the most important part of a good presentation. If it’s your personal story, that’s even better. But if it’s someone else’s story that is just fine. Any story is better than no story. When you’ve given a speech or a talk, stay around after and offer to speak again to others, maybe even on different subjects. It’s amazing how much business comes when you stick around, have coffee and talk to people. Sometimes, this will cause people to ask you to come and speak to their organization. Many speakers have developed this to the point that they get two bookings from every talk they give. In the course of their talk they’ll say, “By the way, I give variations of this talk to different organizations in different industries with different problems.” People will come up afterward and tell them about their business and ask if their talk would be helpful to them. If you want to speak internationally after making a name for yourself follow these steps. 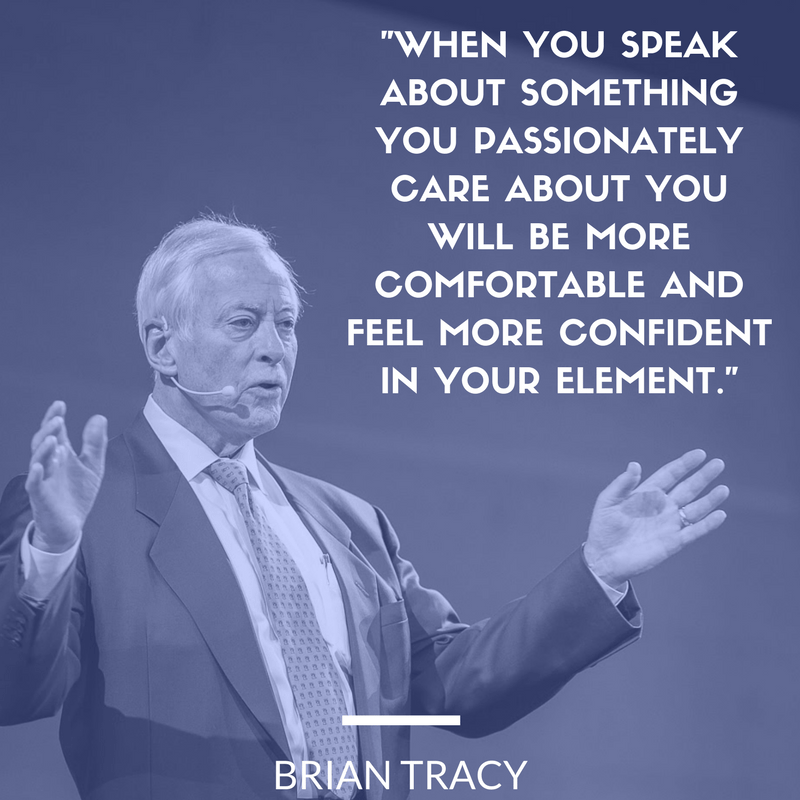 Finally, I like to offer you some of my favorite public speaking quotes to help motivate you. Are you passionate about spreading your message, creating a lasting impact and making more money through speaking and communicating effectively? Becoming an accomplished, effective, sought-after speaker isn’t simple. It’s the result of putting together a careful, highly specialized plan. And it’s not your fault you’re not as effective a communicator as you want to be. Speaking doesn’t come naturally to everyone, and without experience and expertise, it’s difficult to know how to turn speaking into a successful business and spread your message effectively. I can show you how to do these things an more in my public speaking course: The Six Figure Speaker. Click here to learn more about The Six Figure Speaker. 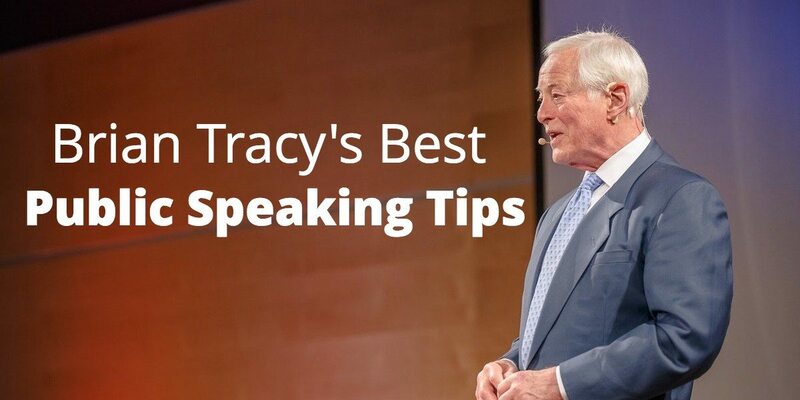 Learn the best public speaking tips from a public speaking legend, Brian Tracy, who has spent over 30 years traveling the world giving talks and speeches.